Our guest blogger this week is Dr. Bernard K. Means. 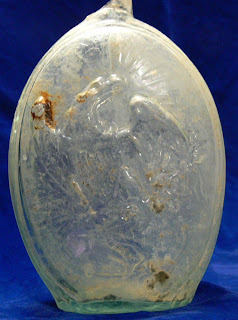 Dr. Means has been conducting research for several years on some of the collections curated at The State Museum which were excavated under the Works Progress Administration (WPA) in Pennsylvania during the 1930’s and early 40’s. This week’s artifact is a fragment from the rim of a pottery vessel recovered from “Fire Pit 10” at the Gower site (36So6) sometime between December 20, 1939 and March 2, 1940. 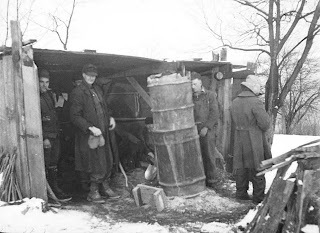 The site’s excavations were directed by Edgar E. Augustine, Sr., as part of a series of Work Projects Administration (WPA)-funded investigations in Somerset County, Pennsylvania. The WPA was one of Franklin Delano Roosevelt’s New Deal programs and was designed to provide work for the unemployed during the Great Depression. 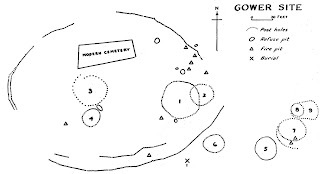 Three of the dwellings—Houses 1, 3, and 4—appear to have been associated with the palisaded enclosure, while the remaining dwellings—including House 2—formed an arc that overlaps the palisade. 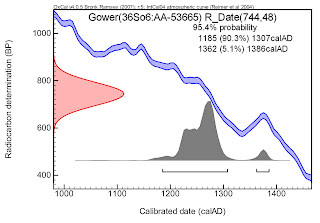 Two radiocarbon dates were obtained from the Gower site through the dating of burned food adhering to the interior of two pottery vessel fragments that are in the archaeology collections of The State Museum. Only one of these dates was valid and showed that the palisaded part of the Gower Site probably dated to the end of the thirteenth century A.D. Unfortunately, no other material suitable for obtaining radiocarbon dates exists in the Gower site collection at The State Museum. This collection is fairly small, consisting of just under 100 pottery vessel fragments, likely because most artifacts were given back to the farmer who owned the Gower site—this was the typical WPA practice in Somerset County. With the exception of the vessel fragment shown here, most of the pottery vessel fragments were fairly unremarkable, tempered either with crushed shell or limestone, and therefore not that useful in providing another possible date for the Gower site. The pictured vessel fragment tells another story. 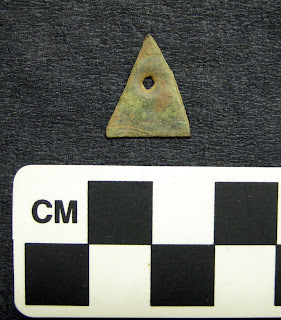 As noted above, this vessel fragment was found in Fire Pit 10, which was located in House 7. Dr. William C. Johnson, a well known expert on American Indian pottery, was kind enough to examine this vessel fragment in detail. He noted that this vessel fragment was tempered with igneous rock and quartz, and has rectilinear incising at opposing angles on the upper part of the rim, somewhat resembling a chevron pattern. Overall, the vessel fragment bears close similarities with the Shenks Ferry Incised pottery type, which would date the arc of dwellings between A.D. 1300 and1575. While not precise, the identification of this pottery vessel fragment from the Gower site suggests that the arc of dwellings dates some time—perhaps a long time—after the palisaded part of the site. Analysis of the field records and artifacts resulting from the WPA excavations at the Gower site is ongoing by Dr. Bernard K. Means. 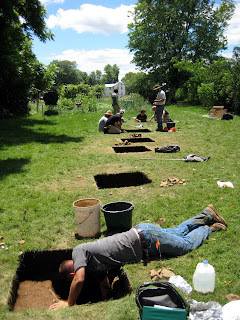 The Gower site was the only WPA-excavated village site in Somerset County that was not subject to an article by lead excavator Edgar Augustine in the pages of Pennsylvania Archaeologist and Dr. Means is working to correct this situation. 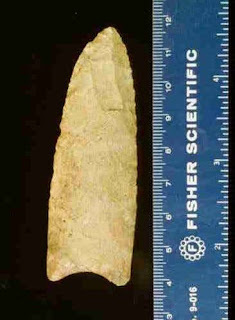 This unique artifact type is principally found on Susquehanna and Delaware Valley sites of the Transitional Broad Spear Tradition circa 3500-4000 years ago. 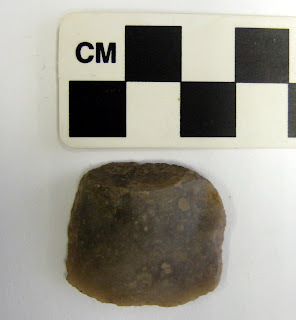 In terms of function, stone picks were prehistoric mining implements used to extract blocks of steatite from outcrops found in the east-central Piedmont region of southeastern Pennsylvania. Once quarried, the blocks of steatite, also known as soapstone because of the material’s slippery feel when handled, were carved into stone bowls and other utilitarian containers used in boiling liquids and cooking food. Stone picks, shown here, were made from hard resistant lithic materials like diabase, hornfels and basalt, also local to the Piedmont region. These crudely made bifacially formed tools usually have an elongated shape 11 – 20 centimeters in length and possess a blunt or nearly rounded poll. The opposite end normally tapers to a point or bit which acts as the tool’s working edge used to carve and shape the soft blocks of steatite into finished bowls and other items. Upon close examination the working or tapered end on these tools is characterized as chisel-like, a part of the tool that had to be intentionally sharpened with an abrasive honestone of gritty gneiss or sandstone. Rarely were stone picks bi-bitted although one example in our collection has a bit point on each of its ends. 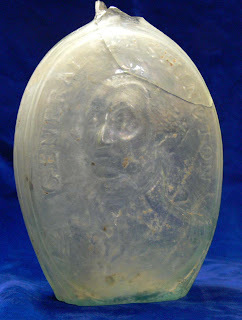 Many of the steatite containers in the State Museum of Pennsylvania retain the residual chisel-like scars of the stone pick. Most often these scars form parallel discontinuous grooves on the exterior and basal portions of the bowl. Rarely are the telltale grooves evident on the bowl’s interior face where the scars were apparently scraped smooth during the final production stage. Certainly the quarry pick was a crude tool aesthetically, but it was also an important element of the Transitional Broad Spear Period tool kit. It was an implement used to make other implements, that in turn, supported a cooking technology new to the region that accommodated an improved way of life well before the development of ceramic containers at the onset of the Woodland period about 3000 years ago. 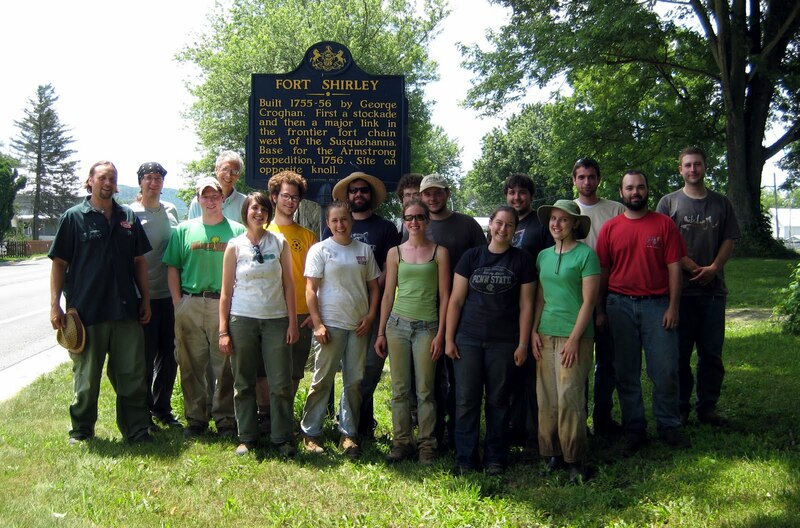 The 2010 field season project (May 17-June 25) was comprised of 14 PSU field school students instructed by Dr. Jonathan Burns who was assisted by the professional staff of AXIS Research, Inc., a non-profit research organization based out of Huntingdon County, Pennsylvania. The objective for the field school was to investigate the most probable location of Colonial era Fort Shirley [1754-1756] as evidenced by documents and maps.The site was also the homestead of well-known Irish-born trader and Indian Agent, George Croghan; with the Seneca Mingo settlement, Aughwick Old Town, located on the nearby floodplain of Aughwick Creek. The project has brought together researchers and students from Penn State University, Indiana University, Juniata College, and beyond to take part in a truly interdisciplinary investigation of this culturally significant location.In addition to the field and lab work, the learning experience was supplemented with a field trip taken to Fort Ligonier and Fort Loudoun, a soil identification module instructed by Dr. John Wah, and two lectures on fort archaeology in Pennsylvania by Stephen Warfel. After six weeks of excavation, Dr. Jonathan Burns and Dr. Paul Raber are convinced that they have located one of the fort's palisade walls and a nearby cooking feature. The linear palisade trench is over 95 feet in length, complete with evenly spaced post remnants. 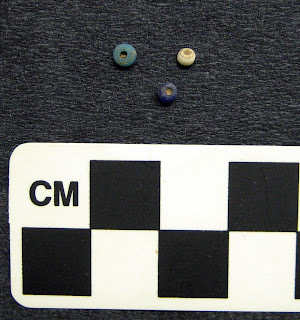 Period artifacts include: musket parts, lead balls and shot, English gun flints, Native American tinkle cone ornaments, copper projectile points, and glass trade beads. The collection (16,424 cataloged artifacts) will be analyzed over the next year and a preliminary report produced before they go back for a second field season in 2011. This is one of the few Colonial Era sites in central Pennsylvania where Native Americans were living along with Provincial colonists, and it has produced important data and set the stage for continued investigation. On Friday, July 2nd, a ceremony was held along River Road in Smithfield Township, Monroe County. The purpose was to celebrate a new Pennsylvania state historical marker. The marker was dedicated to the Shawnee Minisink archaeological site (36Mr43). The site has had a major impact on our understanding of past cultural behavior at both the national and international level. However, the marker ceremony is also about the archaeologists who worked at the site and just as importantly, about the local government who is preserving the site. Don Kline, avocational archaeologist, discovered the site in 1972 and Dr. Charles McNett of American University excavated the site between 1974 and 1977. During that period, over 3900 square feet was excavated to a depth averaging eight feet, producing over 55,000 artifacts. Other than the Meadowcroft Rockshelter, it has yielded the earliest carbon 14 dates for human occupation in the Commonwealth and some of the earliest in the eastern United States. The site is stratified and encapsulates nearly 11,000 years of Pennsylvania prehistory. It was listed in the National Register of Historic Places in 2007. The ceremony was very well attended with between 50 and 75 people at the site. Brian Barrett, Smithfield Township Manager, Joe Gingrich, graduate student at the University of Wyoming, R. Michael Stewart, Temple University professor and Kurt W. Carr, State Museum archaeologist, gave brief presentations. About 50 people returned for lunch at the township building where they were given PowerPoint presentations on the significance of the site. Smithfield Township did a great job in organizing the event and they seemed very pleased with the turnout. At least one TV station filmed the event. Historic marker dedication ceremonies vary greatly in their content but this was one of the best. These events really do get people excited about their heritage. Shawnee Minisink has made several important contributions to our understanding of past cultural behavior. It contains significant Woodland and Archaic period deposits. However, it is most notable for its contributions to Paleoindian studies and these will be emphasized below. The Paleoindian living floors are defined stratigraphically and by two Clovis fluted points and several carbon 14 dates. The site is very well stratified and the Paleoindian levels are separated from the Early Archaic occupation by a thick layer of flood deposits that prevents the mixing of artifacts between these two time periods. These artifacts have not moved since they were originally dropped nearly 11, 000 years ago. Several clusters of flakes have been identified that seem to represent where one individual sat and made or re-sharpened stone tools at the end of the last Ice Age. The site is also significant because it was one of the first Paleoindian sites in the East to yield features. The charred remains from these features produced surprising data on the Paleoindian diet and the Late Pleistocene environment. Paleoindians have frequently been portrayed as “big game hunters”, killing mammoths, mastodons and extinct forms of bison. However, the charred hawthorn seeds, hickory nuts and fish bones found in the Shawnee Minisink hearths support the argument that Paleoindians in the East were generalized foragers rather than specialized hunters. The early environment of northern Pennsylvania has been characterized as a cold, spruce dominated open forest. However, the presence of charred hickory nuts and charcoal from other deciduous trees in the hearths suggests that the vegetation was a combination of coniferous and deciduous species integrated into a mosaic pattern not found in the world today. The data from Shawnee Minisink has made a significant contribution to revising our environmental reconstruction for the region. In 2003, Don Kline and Joe Gingrich returned to the site and worked there for six more seasons. Several hundred square feet were excavated, and thousands of Paleoindian artifacts were recovered. Some of the more exciting specimens consist of over 150 endscrapers and a second Clovis fluted point. Two additional hearths were uncovered and the charcoal produced dates of between 10,900 and 11,000 years ago (radiocarbon years). These are the earliest dates for Clovis fluted points in the East and have significant implications for the peopling of the New World. The traditional model of interpretation is called “Clovis First” and it has humans entering the New World at about 12,000 years ago, inventing fluted points in the western United States and quickly occupying the Americas by 10,500 years ago. 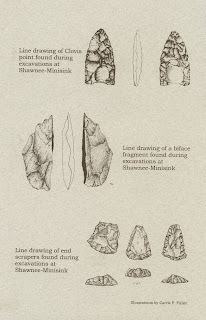 The early dates from the Shawnee Minisink site demonstrate that fluting appears in the East at a very early time and, along with data from sites in Florida strongly supports the hypothesis that fluting was invented in the southeastern United States and that humans were in the New World thousands of years prior to fluted points. The historical marker program, which had it beginnings in 1914 (with the Historical Commission), is now one of the most popular and most innovative programs of the Historical and Museum Commission. Over 2000 dot the state and each establishes an important link to the past. It is hoped that this marker will not be the end of the story but will instead, provide encouragement for further study and discussion at the Shawnee Minisink site.The Shawnee Minisink site is significant both nationally and internationally. It has contributed to a major shift in our interpretation of the Paleoindian diet, Late Pleistocene environment and the peopling of the New World. The archaeological community owes a debt of gratitude to Smithfield Township for commemorating the significance of this site and contributing to its preservation. Many archaeologists have been part of this research but it all began with the persistence of Don Kline and his discovery 38 years ago. It seemed appropriate to continue with the Philadelphia theme as this weekend we celebrate Independence Day. 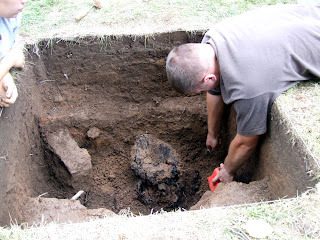 In 1976 while our nation was celebrating its bicentennial a group of archaeologists excavated a section of old Philadelphia treading in the footsteps of our forefathers. 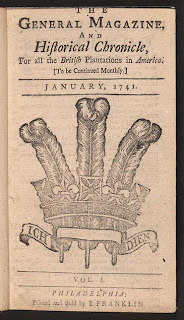 The area was once known as the city’s printing section; housing Benjamin Franklin’s first printing office and where he launched the countries first monthly magazine The General Magazine and Historical Chronicle for all the British Plantations in America. The excavations were undertaken by Penn DOT due to the construction of an access ramp for traffic between the Penns Landing Development and Market Street over a section of Interstate 95. It included the demolition of structures from Market Street to Church Street and between Front and Second Street, a total of 34 properties. The firm of Abraham Levy Architect, under the direction of Herbert Levy and Charles Hunter, was hired to conduct archaeological salvage prior to demolition. 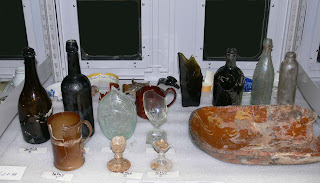 The artifacts recovered from this excavation are varied and prolific spanning the time of Philadelphia’s existence, from its informal founding in 1682 to the structures and debris current to the time of excavation, 1976. It was in the basements of these structures, under floor boards, brick pavers and concrete that “stains” or features emerged. Many of these features were found to be either privies or wells that had been filled over time with domestic trash; including ceramics, glass stemware and bottles, butchered faunal remains and personal items like smoking pipes, coins and buttons. Using the diagnostic artifacts archaeologists were able to date the wells and the layers within them. One such well, located at 121-123 (old #37-39) Market Street and sealed about 1760 contained an assemblage of artifacts that ranged from pipe stems to wine glasses, a copper William III half penny (1694-1702) and the remains of over 160 separate ceramic vessels. The ceramics from this feature included a group of slip decorated earthenware. Thanks to the research of Dr. David Orr the origins of these slipware vessels were traced to Staffordshire England; but even more remarkably he was able to establish a link between them and their creator, Samuel Malkin (1688-1741). In his article Samuel Malkin in Philadelphia: a Remarkable Slipware Assemblage, published in the journal Ceramics in America, 2003; Dr. Orr describes Malkin’s unique style of “relief-decorated and press-molded earthenware”. 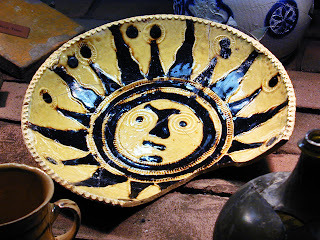 A closer look at Samuel Malkin’s Sun Plate can be had by visiting the second floor Archaeology Gallery of The Pennsylvania State Museum. Unfortunately due to time and budget constraints at the time of excavation as well as the volume of material recovered only a portion of the artifacts from this Market Street Collection have ever been analyzed. They fall into the category of incredible potential, awaiting a researcher like Dr. David Orr to look a little closer in an effort to put together another puzzle piece of our nation’s amazing heritage.